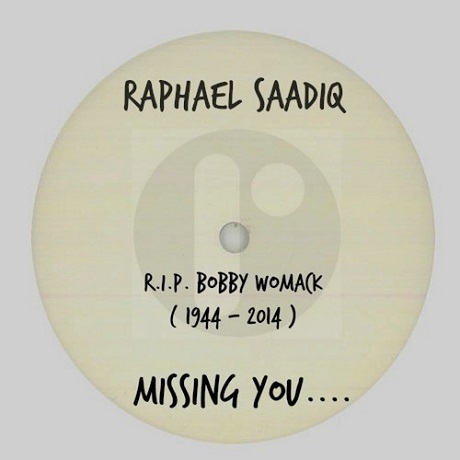 Raphael Saadiq "Gonna Miss U"
The death of Bobby Womack on Friday (June 27) hit music fans hard, with the web currently surging with condolences and tributes to the late soul singer. Raphael Saadiq, meanwhile, is honouring the legend with a new track called "Gonna Miss U." The throwback soul maestro is in fine form on the single, which he finished upon hearing about Womack's death. A quick intro from Snoop Dogg on the topic of loss ushers us into the song before it swells into crestfallen chord arrangements, slender sitar licks and plaintive and powerful vocals from Saadiq. Cymbal stops and minor key guitar punctuate the unanchored Saadiq's attempt to hold on to something powerful. "Bobby Womack is one of my musical soul International known Heroes," Saadiq said in a statement. "Never had to chance to work with him, or even talk to him, but I did get a chance to shake his hand and say hello, although he didn't know when I spoke to him, if felt like I knew him for a very long time, my parents would always play Bobby Womack Records in the house, and I continued to listen to them, so, much love to Bobby Womack and his Family."